If you were asked to define youth, what would you say? Members of the Fargo-Moorhead community were challenged to think about this, along with the potential of the community’s youth, at the TEDx Youth event on Nov. 18 at the Plains Art Museum. The event specifically targeted high school students in the community, emphasizing their potential, but the audience ranged from high school-aged students to community professionals. Several Concordia students were involved in the planning of the event, including senior Meagan McDougall and junior Cathryn Erbele. TED Talks, or technology, entertainment and design, focus on “ideas worth spreading.” The TED conferences, which began in the 80s, are events held around the world. Different speakers are brought in and their presentations are recorded and put on the web, said Joe Burgum, one of the organizers of this TEDx Fargo event. There are also TEDx events, said Burgum, and this one specifically focused on the idea of the potential of the community’s youth. Nov. 18 was Youth Day and this TEDx event was just one of many going on worldwide. With seven live speakers, ranging from middle school students to college graduates, three videos of past TED Talks, and three breakout sessions, Burgum said the event aimed to form relationships within the community. “There are people that speak and their ideas have legs,” Burgum said. He said that with all of the students in the community, there are endless amounts of ideas ready to take off, such as TEDx Talks taking place on local campuses. McDougall said this would allow the ideas of students to be voiced and shared with other members of the community. Joe Sulik, a junior in high school, shared his nature photography skills. He explained that he has recognized this as one of his talents and passions, and it is a way he can contribute to making the world a better place, specifically in advocating for the protection and restoration of the environment. Rosie Savageau, Miss North Dakota and Concordia alumna, discussed her experience with diversity through her musical talents. Savageau said that just like how music has different styles and influences, so do people. By sharing our own diversity stories with those that are different than us, we can find an easy connector and build from there, she said. TED encourages unity, McDougall said. It targets students through what TED offers and connects them in different ways. McDougall was able to connect with other students in Fargo-Moorhead as a part of the seven-week planning process for this TEDx event. She initially got involved through Concordia’s Student Government Association. As a part of this team, she helped find speakers for the event. They worked with other members of the community, including students from NDSU. The diverse representation within the group allowed them to pool their resources to find the people who would be the most engaging, McDougall said. Photo by Jordan Elton. A group of Concordia students helped plan the TEDx Youth event which took place on Nov. 18. 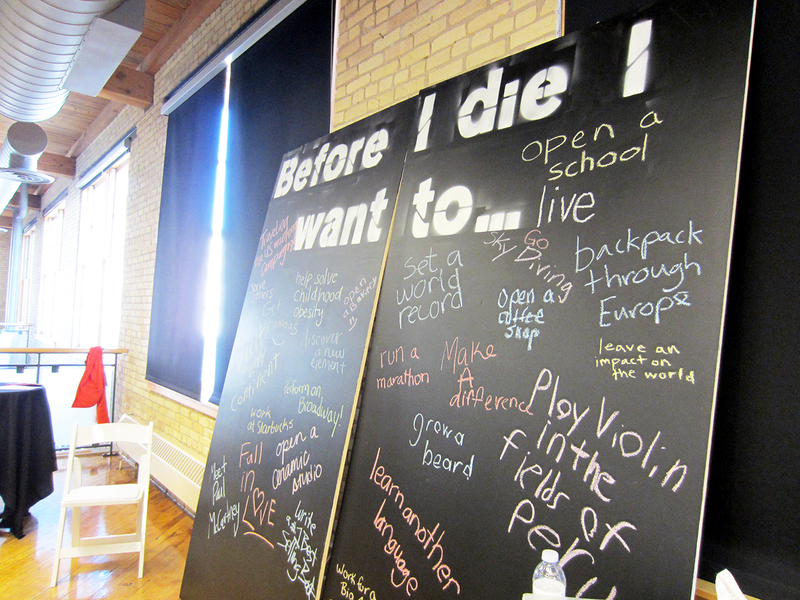 The chalkboard above encouraged participants to think about the ways they want to live their life. McDougall also said that at Concordia, a lot of the focus of becoming responsibly engaged is on a global scale. It is important to keep in mind that students can have just as big of an impact in their own backyard, she said. Erbele was also a member of the planning committee, specifically focusing on the flow of the event. Erbele said this was a great learning opportunity for her, as she picked up new skills, such as fundraising, but also applied things she has learned from Concordia. Erbele said the event was a success with the activities planting seeds in the community and getting the participants excited about the potential of the youth. This is the fourth TEDx event in Fargo this year, with one more coming up on Dec. 1.